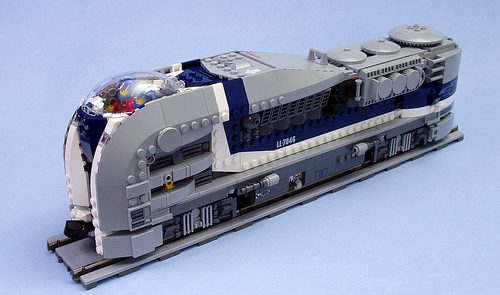 The concept of futuristic trains is hardly new, but I’m surprised this theme has not been explored much by Lego builders, many of which are train fans as well. I’m delighted to see this futuristic yet realistic looking locomotive by Peter Morris. Reminds me of the train in the Firefly episode ‘The Train Job’. Still annoyed the Firefly CUUSOO was not put forward. Ah well. This really is a great idea. It really does remind me of that Firefly episode. What’s the opposite of Steampunk? Futurepunk?